September in the Keys are typically pretty slow for the average fishing guide and charter boat. School is back in session and families aren’t traveling as they were in the mid summer months. Last year at this time we were a lot busier before we all had to evacuate due to Hurricane Irma. Luckily for us, this year is very mild with tropical developments and fishing is great! We are seeing a nice variety in the backcountry as well as nearshore reefs when the winds are lower. This gives us a great opportunity to get into a huge assortment of fish throughout the day. The weather lately has been a hair windier, so we have been staying in the shallows. This is just from the front/back sides of small summertime weather systems. Luckily, it doesn’t make it uncomfortable on the water. The mornings have been starting out with looking for some leftover tarpon in some of the channels (depending on the tide). Most of our tarpon are gone since they migrate through in the spring and early summer, but you can still sometimes get lucky and find a few stragglers around. After this, we take off into the deeper parts of the backcountry to go after fish either on top of the flats (sight fishing) or fish that are around the islands in deeper parts of the shallows. 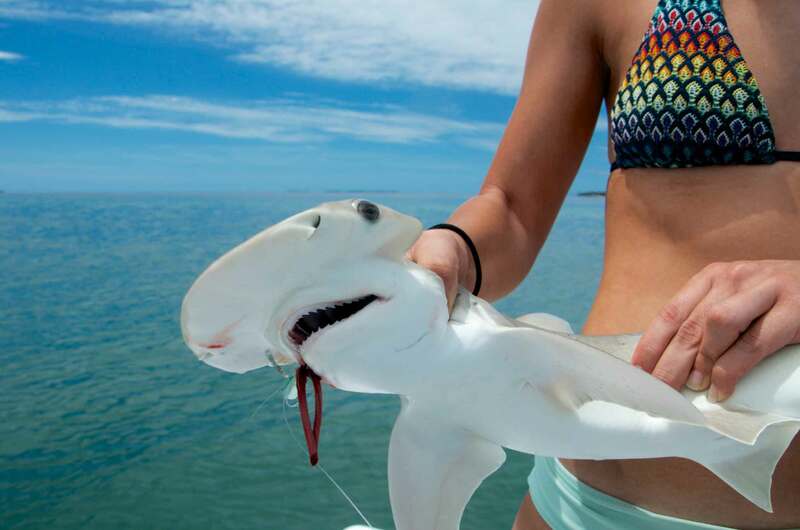 Fish on the flats would include permit, bonefish, bonnet head sharks, and barracudas. As stated before this is 100% sight fishing, so it’s not too fun for younger kids or any sort of “impatient” fisherman. The reward though is great considering how fun it is to watch a fish come up and eat what you’re offering. Fishing in the islands, channels, and deeper parts of the shallows include your big variety of species. You may find anything from barracuda, sharks, mangrove snapper, lane snapper, juvenile grouper, jack crevalle, yellow jacks, blue runners, mackerel, and more. This type of fishing is mostly blind casting. That involves throwing lures of some sort into the area and working them back to the boat. Also, drifting a live bait into that area (if the tide is correct for that technique) is another good approach. Typically the buck tail jigs are the favorite of the day since everything eats them. There are certain fish that won’t eat bigger lures or live bait, so it gives us the best option. Call/text 305-509-2201 or go to the Bookings Page for availability! Bring up this fishing report for 15% off now through September (when booked through the site)!